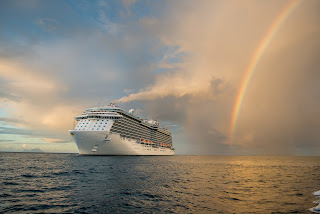 The Cruise Blog by Direct Line Cruises, Inc.: What is Princess Medallion Class? using interactive displays throughout the ship, on stateroom TVs or via guests’ own mobile devices. For example, guests can find their way to venues around the ship, make reservations at the spa, specialty dining restaurant and shore excursions. Guests can arrange celebrations, have food orders delivered to them anywhere onboard the ship, view their photographs, learn about the destinations they will visit and activities at each port of call and more. The Ocean Compass will alert guests to experiences based on their individual needs, wants and desires. More announcements surrounding innovations and enhancements from Medallion Class Ocean Vacations will be announced in the months leading up to the first sailing. Princess Cruises Ocean Medallion Class will debut on Regal Princess in November. It will then expand to Royal Princess and Caribbean Princess in early 2018. Ultimately, the plan, is to utilize the technology on other fleets in the Carnival Corporation family, which include Carnival, Holland America, Cunard, and Seabourn.